JBL updates family of wireless speakers and headphones | What Hi-Fi? New speakers and headphones, designed for active people. 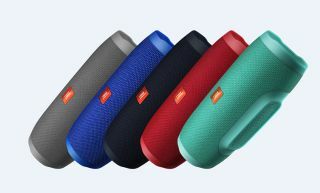 JBL has just announced a whole bunch of speakers and headphones, designed for outdoor and/or active use. The Clip 2 and Charge 3 are both portable Bluetooth speakers. Both are coated in durable fabric and waterproofed with IPX7 certification. That means they can take a lot of punishment, including being submerged in water. The Clip 2 is the more obviously portable of the two, featuring a carabiner for attachment to clothes or bags. It can be daisy-chained with another Clip 2 speaker via Bluetooth. No Bluetooth? Then you can plug in your music player with the built-in 3.5mm cable. Its li-ion battery promises eight hours of play time. The Charge 3 is bigger and means serious business, as indicated by its two external passive bass radiators. Its party trick, as with previous generations, is that it doubles up as a USB power bank for charging other devices. The 6000 mAh battery promises 15 hours of play time (less if you use it as a charger). Both speakers will be available in Spring 2016. The Clip 2 will cost £50, while the Charge 3 will cost £150. JBL has also launched some wireless sport headphones, in partnership with Under Armour. There are two pairs: the UA Headphones Wireless Heart Rate and the UA Headphones Wireless. The UA Headphones Wireless Heart Rate’s party trick is – surprise, surprise – the ability to monitor your heart rate. Other than that, the headphones boast Bluetooth 4.0, with a three-button mic/remote. Twistlock technology guarantees the buds will not fall out during exercise, while an IPX5 rating makes them sweat proof. Battery life: five hours of playback. The UA Headphones Wireless are virtually identical, but with no heart rate monitoring. That puts less pressure on the battery, which claims to last eight hours on a full charge. The standard UA Headphones Wireless cost £140, and will be available in Europe at the end of February. The Heart Rate, meanwhile, will cost £230. Release date to be confirmed.